Digital LED Strips can be controlled per 10cm, which makes it possible to create special light-effects such as horse-race and rainbow. The sets on this page consist of a digital LED Strip in the chosen length, including power supply and controller with remote. You can also choose for a programmable controller. Using the software included with this controller, you can create your own light-programs! 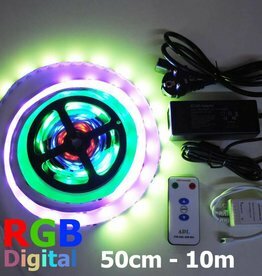 Complete RGB / Magic / Dream Digital LED Strip 3 meter set. This Digital LED Strip makes it possible to create advanced effects. Each section of 3 LEDs is separately controlled by the digital LED Strip controller, making spectacular effects possible! These digital Magic LED strip sets can be installed without any technical knowledge. If there is any question or doubt, you can always contact us for support. Digital LED strips are controlled by a special digital LED Strip controller. There are many types of digital controllers. The sets on this product page are composed in such a way that the LED strip and the controller always fit together. On our website you have the choice of pre-programmed controllers and controllers where you can create your own lighting program. These programmable controllers are equipped with SD card and PC software. With this software you can create all possible lighting programs that you want. Here too, if you have any question: Please contact us for help! With Magic / digital LED strip you can make the most advanced light effects. The applications vary widely, from bar- or restaurant-lighting to works of art and hobby projects. Because the digital LED strip can also be cut up and installed in special configurations, it is possible to realize all kinds of different special setups, such as video-screens. In addition, the digital programmable controller can be connected to a PC and the images on your screen can be transferred to a digital LED strip. So it is even possible to play a video on your digital LED screen!